The Stingers women’s basketball team won their first game of the season on Nov. 28. The Concordia Stingers women’s and men’s basketball teams hosted the Bishop’s University Gaiters on Nov. 28 in their last games before the winter break. The Stingers women’s basketball team was looking to capture their first win in league play, while the men’s team was looking for their third win of the season. In the end, the women were victorious with a 69-43 blowout win. The men’s team lost their game 66-60 after having the lead for the first three quarters. On the women’s side, the Stingers dominated the Gaiters in the first quarter. Midway through the first quarter, the Stingers were boasting a 12-1 lead. Stingers shooting guard Marie-Eve Martin was a big reason why the Stingers were up as she knocked down back to three-point shots. By the end of the first quarter, the Stingers were up 16-6. Stingers point guard Tamara Pinard-Devos goes down the court on Nov. 28 against the Bishop’s Gaiters. Photos by Brianna Thicke. In the second quarter, the Stingers continued their dominance as point guard Tamara Pinard-Devos gave the Stingers the first points of the quarter. Pinard-Devos would score five more points in the quarter. The Stingers went into the locker room at halftime leading by 18 points, 36-16. The Gaiters got the first points of the third quarter on a basket by guard Noemie Hamel-Petit. Martin of the Stingers then scored the first points for the team in the quarter with a three-pointer. The Stingers played great defense and caused turnovers and shot clock violations. The Gaiters did not score a basket for five minutes in the quarter which was the turning point in the game. The Stingers led by a score of 50-28 after three quarters. The Gaiters scored the first points of the fourth quarter on a basket by forward Charlene Pettigrew. 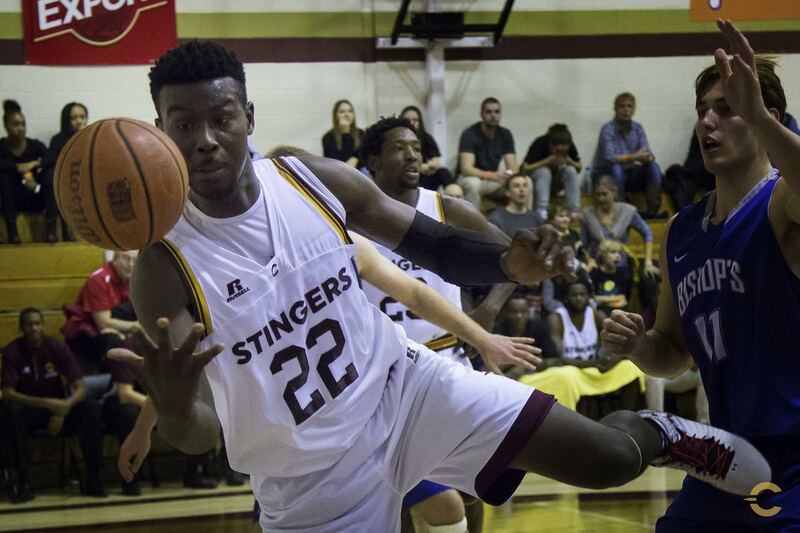 The Stingers responded with a 7-0 run including another three-pointer by Martin to seal the win. Marie-Eve Martin had 23 points and eight rebounds in the victory. “We need to improve on our effort for four quarters,” Gittens said about the team’s goal for the second half of the season. On the Men’s side, the Stingers started the game off by dominating for the first five minutes. The team led 10-0 after guard Jaleel Webb hit back-to-back threes. The Stingers ended the first quarter in full control of the game, leading 25-13. Stingers point guard Frank Mpeck looks for an open player on the court. Photos by Brianna Thicke. The Gaiters got on the board first to start the second quarter as forward David Belanger drained a jump shot. The Stingers big lead began to diminish late in the quarter as the Gaiters cut it down to nine points. In the last minute of the half, the Gaiters cut the Stingers lead to seven on a three-pointer by guard Jonathan Bermillo. The score was 33-26 at halftime. The Stingers started the third quarter with a bang as Jaleel Webb hit a three pointer to put the lead back to ten. Things began to unravel for the Stingers with three minutes to go as the Gaiters mounted a comeback led by Abdul Kamane. Kamane scored seven points to end the quarter which saw Bishop’s cut the Stingers lead to just five points, at a score of 48-43. Stingers forward Ahmadu-Tijani Umar goes for the ball during the Stingers game against Bishop’s. Photos by Brianna Thicke. The fourth quarter was filled with dramatics from both sides. The Gaiters started the quarter with a 7-0 run to take the lead which was capped off by a three-pointer from Bermillo. The Stingers retook the lead on a three-pointer by Webb. The Gaiters took the lead for good with four minutes left as Bermillo hit back to back three-pointers. Stingers forward Ken Beaulieu did make things interesting late as he cut the Gaiters lead to three after a three-pointer. However, the game would end 66-60 in Bishop’s favour. “We have to get mentally tougher and some of our young guys need to learn how to compete for forty minutes,” said Popovic.